一毫子郵票機,對今日的我們來說實在沒有什麽親切感,但卻又是我們的一件恩物, 至少是正在塞滿你柜桶內一大堆亳子的歸宿. 但話說回來, 不知從那日開始, 毫子變得沒有價值, 尤其是一毫子?是物價高漲令它扁值呢? 又或是人類忙這忙那變得沒時間去招呼這一大堆"散銀"呢? 小時常會從這種售賣機買郵票, 因為覺得它很美, 十分典雅. 逐個毫子放進去等待郵票緩緩彈出, 一點也不覺時間消逝, 總覺得它和紅郵筒給我有異曲同工的感覺 : 令人期待. 也許你會說, 太誇張了罷, 買幾毫子郵票何來這麽多"感受"呀! 我想, 感受是隨着事物的變遷而產生的, 現在要找到這欵郵票機巳經不容易, 也許有一天當一毫子也從我們生活中消失時, 你才會明白它留給我們的不止是"一毫子"的價值. A ten cents coin stamps vending machine...what a good old days product, not much meaning to us now, especially nobody is willing to accept ten cents coin when we suddenly woke up one day in the morning. But infact, this machine is the destiny of all your coins stuck inside your drawer right now. Is the reason of economy growth to lower the cash value or we are too busy for this & that, so we can't afford to deal with all this "tiny little things"? 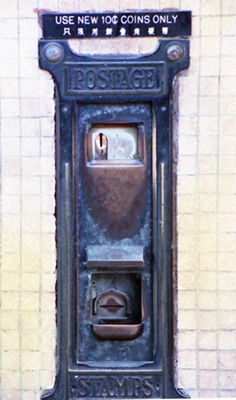 I used to buy stamps from this elegant vending machine when I was young, love to wait aside, insert the coins one by one until a tiny stamps roll out - a desire of waiting to be happened, just like the feeling of insert the letter into a red post box. Well, well...how come so emotional for just buying a few stamps, you may say! May be it's due to the change of things around us, truly speaking, it's not easy to find such kind of vending machine in Hong Kong now; one day, may be not too long, ten cents coin will also vanish in our life, at that moment, you will understand what its really worth of......for sure, not only it's ten cents value, but more!